My church choir has a problem, and others, perhaps, have the same problem. It is one of efficiently transitioning from practicing one piece of music to practicing another. At each rehearsal, our choir director hands out a list of what we are going to rehearse, yet time is invariably lost as singers search for music in their folders. The search is often complicated by cluttered folders containing music that has already been performed but not turned in and by multiple copies of some pieces. Also, my choir director has a habit of referring to music by other than the most prominent text on the front page, so that choir members pass up the proper anthem looking for one that does not exist. I have concluded that managing this problem is one that requires commitment both from the choir director and from individual choir members. The solution is so obvious that I am sure that many choirs must be using a variation of it. Mine is not, however, and we are probably not uniquely disorganized, so I think that others might benefit from my solution to the fumbling-for-the-right-music problem. The choir, at each rehearsal, is provided with two lists, either on the blackboard or on a paper handout. One is a list of composition numbers, in numerical order, representing music that should be in one’s rehearsal folder. The other is a list of numbers indicating the music to be sung, in order, at that rehearsal. At the beginning of each rehearsal, every choir member is expected to check his or her folder against the first list, doing whatever is necessary to see that exactly one copy of each composition is in the folder in the proper order. Music may need to be picked up or turned in. During rehearsal the choir director announces each piece to be practiced by number, never by title or composer. The director must allow sufficient time for the previously rehearsed music to be returned to its proper place in the folder and for the new music to be located. 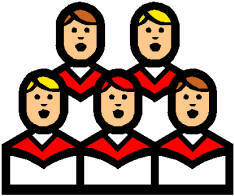 If your choir is not using this system or one like it, why not give it a try?